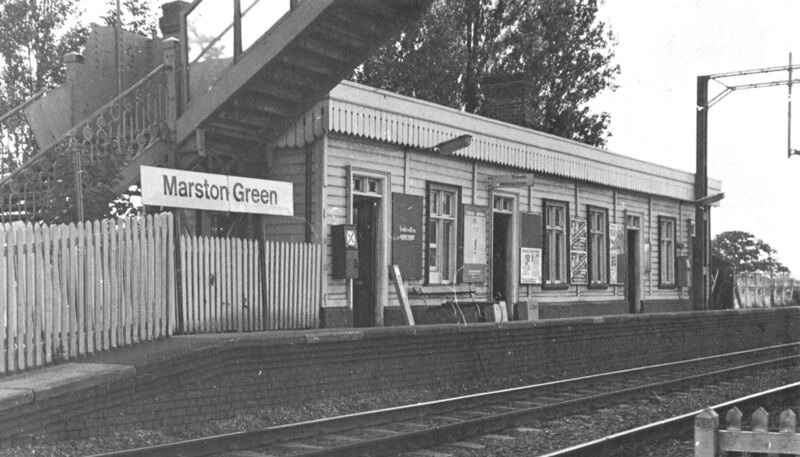 View of the modified ex-LNWR structures on Marston Green's down platform after electrification. Electrification required the footbridge to follow a much higher profile in order to clear the overhead wires. This resulted in the removal of the centre section of the ex-LNWR footbridge to be replaced by a British Railway's design. The photograph shows the section of footbridge on the platform running parallel with the track still to be the LNWR structure whereas the remaining steelwork was fabricated especially for Marston Green station. The timber framed and clad building is also the original LNWR structure but the canopies which projected outwards over the platform have been cut back. The ornate valance seen at roof level are LNWR on the side and British Railways at the front.